The Village Beacon Record published this piece in print on Oct. 27, 2016. 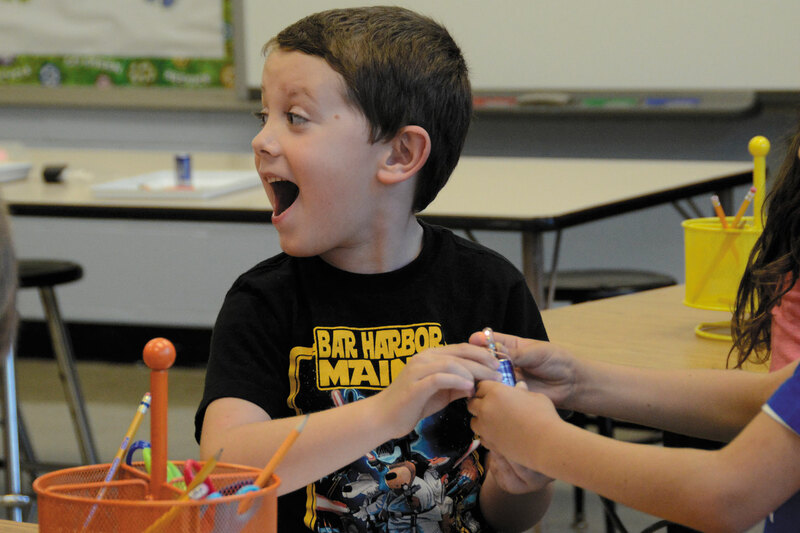 Second-graders in Andrew Muller Primary School’s new science room were beaming with excitement Monday as teachers distributed materials for an experiment — a magnet, paperclip, battery, copper wire, rubber band and lightbulb. The class was learning about interactions. Debbie Trelfa helped her students name each of the items in front of them and asked them to figure out how to make them interact. One table discovered the magnet attracted the paperclip, and Trelfa told her students there was another interaction they could make. Students told one another to “persevere,” and a few minutes later another table discovered they could get the lightbulb to light up by placing it on the battery. Andrew Muller Primary School second-grade teacher Debbie Trelfa teaches a new science lesson to her class. Photo by Rebecca Anzel. 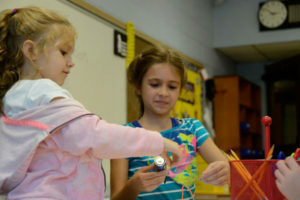 Miller Place school district’s two elementary schools, Andrew Muller and Laddie A. Decker Sound Beach School, adapted an available classroom each to be used as science learning and inquiry labs. Students study topics like weather and plants in an interactive way, as opposed to using textbooks. Instead of a teacher asking students a question with one correct answer, for example, students would instead consider an open-ended one by using evidence presented by a teacher or reading. Or, instead of students reading a textbook chapter and answering questions on a worksheet, they would read multiple sources and write reports and posters about the ideas. According to a NYS Education Department document, the proposed science learning standards will be presented to the Board of Regents this winter. It is the last step in a process that began in January 2015, when the board counseled the Education Department to begin drafting new standards. Since then, the draft was updated with results from a public survey and discussed in June 2016. 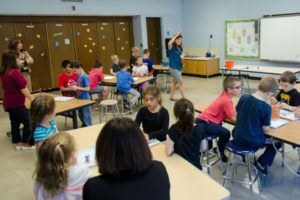 Miller Place is “way ahead of the game,” Assistant Superintendent Susan Hodun said, in beginning to implement science curriculum changes before the new state standards are finalized and implemented. Anna Paesano and Kayla Martins perform the day’s experiment. Photo by Rebecca Anzel. With cooperative learning tables for students to work with and learn from each other, separate storage areas for each grade level and science learning resources displayed, the new science labs further encourage modern teaching methods. 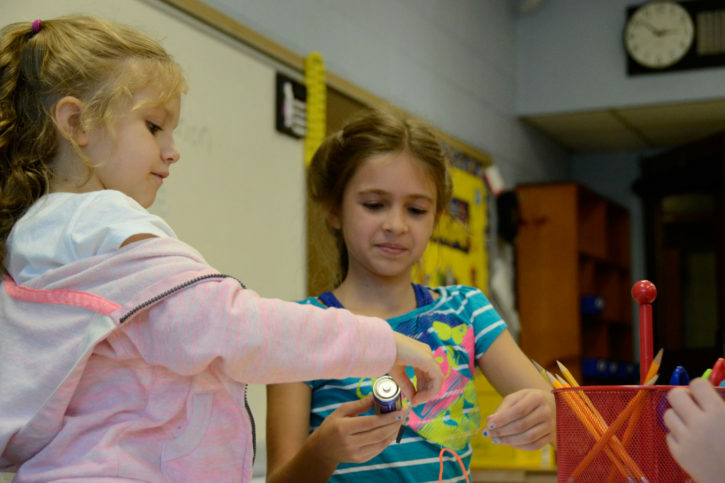 Students spend about an hour per week doing experiments that supplement the time they spend in the classroom learning about science concepts. The teachers and principal at Andrew Muller hope that hands-on experience will help their students as they get older. Max Rutter gets the lightbulb lit inside the new science classroom at Andrew Muller Primary School. Photo by Rebecca Anzel.